is this where a lerp would come in handy? In order to reduce the tiling iterations of the texture, you could use a larger base texture resolution like 2048x2048. Then when you increase the scale via the 'LandscapeCoords', the texture will look a bit better. 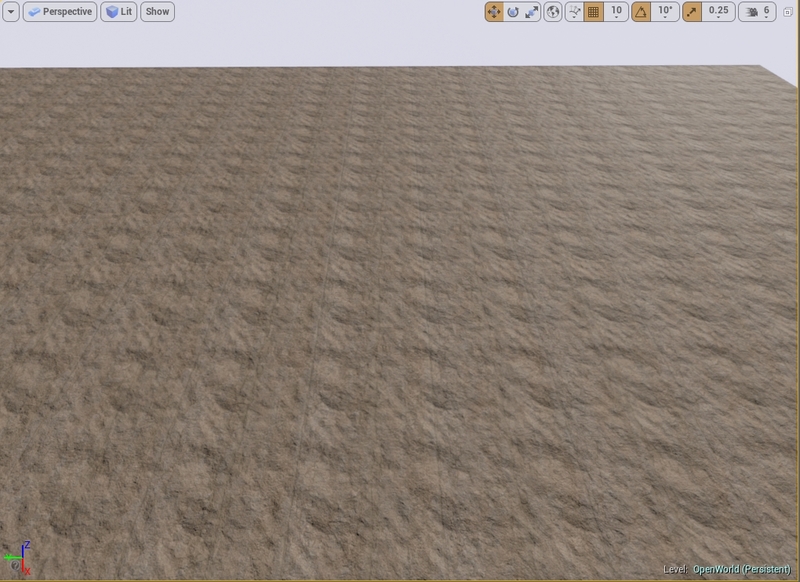 If you have set up your Heightblends in the material editor correctly and your LandscapeLayerInfo, you will notice that when you start to paint the texture will break up and blend with the other layers. Here is a screenshot of a landscape I have painted within a test project. I am using the same material set up that you are using, and through various brush strokes and settings while painting am able to get some pretty good results. Sometimes the best way to break up tiling is to just start painting! If you would like to have some variation within a single texture you can try implementing a macro texture variation on your diffuse color texture, like the one used for some of the materials in the Starter Content. Here is how the macro texture variation looks when applied to my Grass texture within the level. 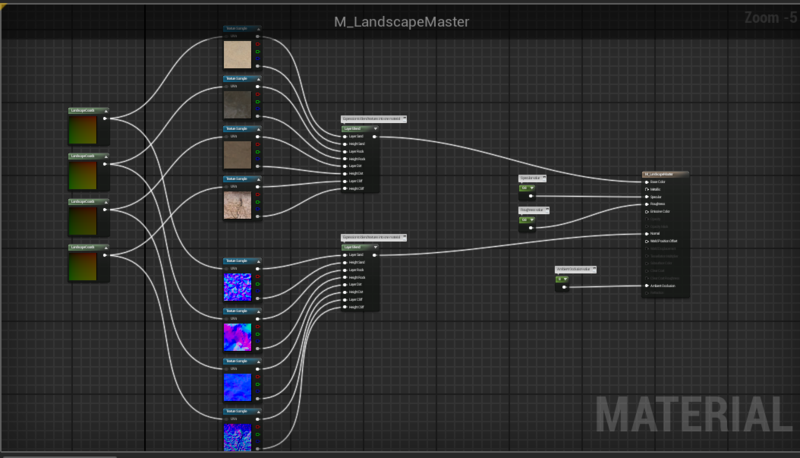 Hopefully will get you on the right path to creating some great custom landscapes. Let me know if you have any other questions or need additional help. EDIT: i think i get what the macro is( i mean you did say why in your post also lol) are those noise textures in the macro? Hi Andrew, I'm new to UE4 and I have the exactly same problem that he had. When I create a landscape and apply whatever a texture to it, the texture creates a huge repeating pattern on the landscape. I tried to use your nodes to fix it, however I couldn't get the macro settings and also I dont know how to add this macro and lerp coordinates like you did. Could you explain your nodes a bit further? Thank you! If you are new to UE4, and you would like to learn more about the material editor and how to use certain nodes and functions, I suggest taking a look at our documentation on Materials. There is a good amount of information in here that is vital to understanding how the material editor works and how and why to use certain material nodes. I couldn't reply to your other comment in this thread. You can actually open this material up yourself in the 'Starter Content' labeled as M_Concrete_Grime. Yes, as soon as you start painting with different layers the textures will break up the tiling a good bit. The macro stuff is a way to overlay different sized grayscale texture samples in conjunction with a single diffuse color Texture Sample in order to help randomize and break up the tiling. Here is an example of using a macro variation and lerping between two Texture Coordinate sizes of the same texture to have a non-repeating material. Keep in mind, these examples can be found in the starter content so you can reverse engineer the materials to better understand the workflow of the material editor and how certain nodes function. Essentially the bare minimum for your materials. A texture coordinate plugged into the UVs of a Diffuse and Normal Texture Sample. I hope this helps clarify a bit on how to break up tiling and various approaches to doing so. One more thing, take a look at the Documentation as well as the Content Examples to dive deeper into Materials! Not intimidating at all, thanks Andrew this should get me on my way to better understanding a material workflow!